Back in 2015, we quit our jobs to travel the world indefinitely. We launched Couple’s Coordinates on June 1, 2015, and used our new home of Florence, Italy as an incubator while the blog was in its infancy. I (Michael) had lived in Florence in 2011 when I studied abroad with my university and was already well versed in the city as well as Italian (more specifically, Florentine) culture. Alex and I adjusted to the Italian lifestyle very quickly, settling into our apartment, purchasing bikes (that ended up stolen 2 weeks later), and immersing ourselves in the culture, cuisine, and history. I even went as far as teaching myself Italian and, today, am quite conversational. During the year that we lived in Florence, we explored every inch of our city as well as a good portion of the Tuscan countryside. We visited neighboring towns, dined at the best restaurants in the city, ate in the homes of locals, took cooking classes, studied Renaissance history, and to a certain extent, became locals. From the inception of Couple’s Coordinates, we knew that we wanted something bigger than a travel blog. We wanted to be a travel company that enabled our readers to LIVE our experiences rather than simply reading them and experiencing them vicariously. The capacity in which we would host travelers and curate experiences wasn’t completely clear until later in 2015 when Alex obtained her RYT 200 yoga teacher certification in Bali, Indonesia. At that point, we knew we wanted to build an experience, a retreat if you will, that combines yoga with the best of Italian culture, cuisine, and history. Thus, Couple’s Coordinates Italy Yoga Retreat. WHAT SETS OUR RETREATS APART? 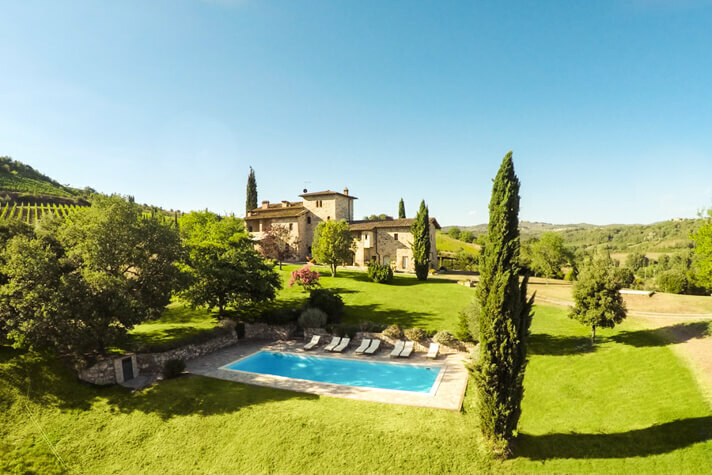 One of the most desirable aspects of the retreat is the private, luxurious, Tuscan villa where our small group of 8-12 will stay for 5 nights. The spacious, 8,000 square foot villa is equipped with a private pool, 8 large bedrooms, and loads of amenities, and is surrounded by 66 acres of olive trees and vineyards. Put simply, it is a Tuscan paradise. One thing we noticed when planning the details of this retreat was that most Italian yoga retreats seem to be hosted at wellness centers or generic venues. The location was of paramount importance to us. We wanted our retreat to provide a local, Tuscan experience. The best way to do that, we figure, is to host the retreat in a luxury Tuscan villa surrounded by vineyards and rolling hills. As we plan to host both couples and solo travelers, we have provided for multiple accommodation types including double occupancy, private rooms with queen beds, and private rooms with queen beds and private bathrooms. Prices vary depending on accommodation type. What truly sets Couple’s Coordinates Retreats apart is the curated experience. We have spent years putting together the perfect itinerary including the very best of Italian culture, cuisine, and excursions. Sure, you’ll see the David and climb the Duomo in Florence, but you’ll also visit the oldest winery in Italy. Yes, you’ll see the Ponte Vecchio and Piazzale Michelangelo, but you’ll also spend the day soaking in the Terme di Saturnia, learning to cook pasta with our private local chefs, enjoying a full-body massage at our villa, hiking in the Tuscan countryside. Some of our relationships in Italy stretch back almost a decade. We have leveraged these relationships and personally hand-crafted every aspect of this retreat to ensure the best Italy yoga retreat available. We have hired 2 incredible local female chefs named Alessia and Barbara to cook you their grandmother’s traditional Italian recipes (or a version that suits your dietary needs). Most retreats seem to provide only breakfast and dinner. We want to ensure that you’re nourished throughout the day, so we will not only be providing breakfast, lunch, and dinner, but also aperitivo, snacks, wine, coffee, tea, etc. throughout the day. 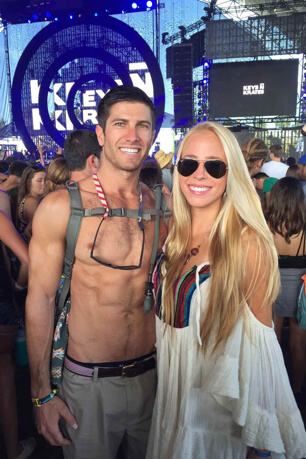 Couple’s Coordinates Retreats are all-inclusive. From the moment we pick you up at the airport to the moment we drop you off to return home, you can sit back and relax, knowing that we have taken care of everything you may need. Alessia and Barbara will cook the majority of our meals with a few exceptions. One day we will be wine tasting at a castle in Tuscany, an experience that is accompanied by a farm-to-table lunch. We will also take you to one of the most historic restaurants in Florence dinner following our full day excursion through the city of Florence. Our final dinner will be a private cooking class at our villa led by Alessia and Barbara. You’ll learn to cook pasta and other Italian favorites and then, of course, we will sit down and devour them! We aren’t pawning you off on a random yoga teacher. Rather, Alexandra will be leading all of our daily yoga classes! Over the years Alex has taught in almost every capacity. Alex teaches classes in studios from Los Angeles to Bali, manages a variety of private clients (experienced, beginner, prenatal, etc. ), is the private yoga instructor for a number of local corporations, and leads retreats around the world. I’m not just saying this because she is my wife…Alex is an INCREDIBLE yoga teacher. She trained under one of the best yogis I’ve ever met, has a deep understanding of breath, anatomy, and physiology of yoga, and has a unique teaching style that empowers beginning yogis while challenging even the most advanced yogis. Her style can best be described as power vinyasa, incorporating the best pieces of vinyasa and power yoga. We will also be leading an acro-yoga workshop and partaking in slow flow yoga most nights. Excited to lay by that pool and do yoga on this beautiful estate? We built a retreat that is perfect for couples and solo travelers alike; a retreat that embraces and empowers both beginner and advanced yogis. Our Italy Yoga Retreat is perfect for the couple, group of friends, and/or solo traveler who wants to join like-minded travelers and indulge in local Italian cuisine while enjoying daily yoga and local cultural excursions. You’ll return home with a full heart and belly, beautiful photos, memories, and life-long friends. Come join us in Italy September 2 – 7 and allow us to FEED YOUR MIND, BODY, AND SOUL!